Item is clean and is the straw top. The straw fits a 12oz, 16oz, 18oz, 20oz, 32oz, 40oz, and 64oz wide mouth mottles. The Hydro Flask Straw Lid boasts a high-flow rate to quench thirst, and durability to withstand the most tenacious teeth. 2 Straws 2 Brushes, BPA-Free Leak Proof. Not fit Hydro Flask Growlers (32/64oz, Internal Threads). Hydro Flask 32 oz Insulated Sports Water Bottle Authentic - Blueberry. Shipped with USPS Priority Mail. Open box brand new no dents. Hydro Flask Wide Mouth Vacuum Insulated Stainless Steel Water Bottle - Black. Condition is New. Shipped with USPS Priority Mail. Brand new navy blue Hydro Flask Flex Boot for 12-24 ounce bottles. SLIP-FREE GRIP: Unlike other leading coffee thermoses Hydro Flask has a powder coat which gives you a solid grip. EASY ACCESS HYDRO FLIP: Whether youre on the trail or the chair lift our Hydro Flip Lid makes it easy to sip lattes and hot chocolate on the go. We will reply you within 24 working hours as soon as we can. Hot drinks up to 6 hours, and cold drinks up to 24 hours. SLIP-FREE GRIP: Unlike other leading water bottles, Hydro Flask has a powder coat, which gives you a solid grip. Hydro Flask 21 Oz Double Wall Vacuum Insulated Stainless Steel Leak Proof Lava. Condition is Used. Shipped with USPS Priority Mail. Hydro Flask Double Wall Vacuum Insulated Stainless Steel Sports Water Bottle, Wide Mouth with BPA Free Straw Lid. Premium grade 18/8 Stainless Steel BPA free Sports Bottle. A Black Rock Hydro Flask! Pacific Blue Wide Mouth 20 Oz. New with Label. Wide mouth. Pacific Blue. About Flaskars We created Flaskars with a single goal: Make drinking easier and improve our quality of life. ✔ FULL COMPATIBILITY: Perfect fit for Hydro Flasks or Kleen Kanteen oz, oz, oz and oz Standard Mouth water bottles. 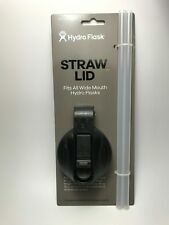 Brand New Hydro Flask Wide Mouth W/ Lid Straw Choose Color! Suitable use for: 18oz,32oz,40oz ,64oz. 1 pcs straw. We will reply you within 24 working hours as soon as we can. Hydro Flask produces vacuum-insulated water bottles that you can take along when you're hiking, exercising, picnicking, or doing just about anything. The plastic tops are BPA-free and phthalate-free and are made using 18/8 professional food-grade stainless steel, a high-quality metal that protects against flavor transfer. You can find new, used, preowned, and affordable Hydro Flask water bottles on eBay at a variety of prices. What kind of water bottles does Hydro Flask carry? Flip lid: This opens and closes in a snap, making drinking on the go easy. Flex cap: This has stainless-steel pivots and a strap that flexes and twists. The caps are made with honeycomb insulation to insulate your hot and cool beverages even more. Sports cap: This keeps your cold drinks cool and makes no whistling sound as you sip from it with one hand. Straw lid: The straw provides an easy way for you to sip from your wide-mouth bottle with one hand. The rubber straw provides fast flow to your mouth, and the cap has a finger loop for comfortable carrying. Are these water bottles insulated? Hydro Flask bottles are vacuum-insulated and keep cold liquids cool for up to 24 hours and hot liquids warm for up to six hours. They have Temp-Shield double-wall insulation that protects any liquid inside the water bottle from outside elements. If you put ice in the flask, it will remain intact for many hours, and carbonated beverages stay bubbly. What colors and designs are available on eBay? There are more than 180,000 Hydro Flask combinations you can choose from. Following some guidelines can help you customize your water bottle from the many options available. Range of sizes: You can find bottles that hold 12, 16, 18, 20, 32, 40, or 60 ounces. Drinking mouth sizes: Narrow-mouth, wide-mouth, and standard-mouth are all options. Lid styles: Flex cap or hydro flip are the options for lids. Bottle colors: There are 14 colors that range from icy cool tones to piping hot hues. Boot colors: There are 15 colors are available. Besides selecting from the above options, you can also choose to buy a Hydro Flask bottle that is new or used. As the used bottles are slightly less expensive, you can save money if you need to buy these water bottles in bulk. Some Hydro Flask water bottles also come with extra accessories like silicone sleeves. Content provided for informational purposes only. eBay is not affiliated with or endorsed by Hydro Flask.